One of the greatest concept artists ever is Ron Cobb (Alien, Aliens, Back to the Future, Firefly). Ron Cobb (born 1937) is an American cartoonist, artist, writer, film designer, and film director. Some of his most memorable work was on the classic film Alien (1979). This is some of his work on the ship Nostromo. The design of the Nostromo is credited to illustrators Ron Cobb and Chris Foss. Ultimately Chris Foss' highly organic visions of the spacecraft were discarded in favor of Cobb's NASA-like utilitarian renderings. 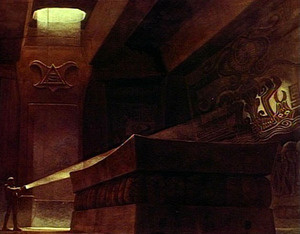 Ridley Scott made his own design contributions as well, adding most of the cathedralesque "refinery" portion, which dominates the craft on screen. Much of the ship's architecture, particularly its interiors and the colossal spires of its refinery structure, are inspired by the cavernous yet simultaneously claustrophobic sensibilities of haunted houses and castles from Gothic Horror films such as Nosferatu. 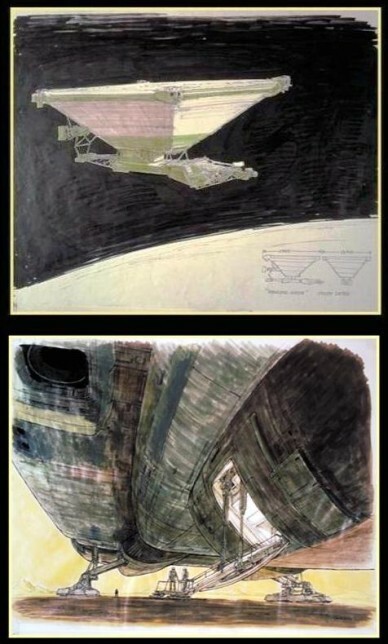 Early Ron Cobb designs for the ship and the Nostromo's ramp and air lock access. 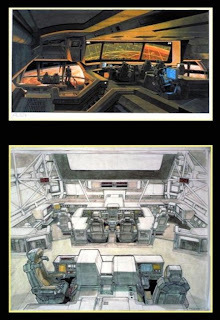 Images from the collection of scenes Ron Cobb painted under Dan O'Bannon's direction to be "shopped" around with the original Alien script. Top pic is an illustration of the ship (then named "Leviathan"), the middle image is of the blueprint elevations of the same vessel, and the bottom image details the arrangement of the ship's interior. 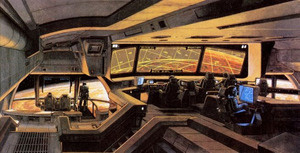 Early Ron Cobb designs for the ship's bridge. Astronauts explore the Alien sanctuary in early concept art. An early design for the Nostromo ship. 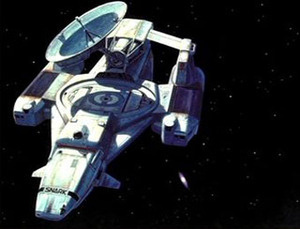 Here's what the ship looked like in the film. Ron Cobb's website isn't up at this writing, but you can check out http://roncobb.net/ later. That is some bad to the bone artwork! I have always admired people who could draw so darn well. I have a friend who is an Indie director. He does his own story boarding a lot of the time. It's such a fascinating art. Thanks Teresa! There are some great posts out there so I appreciate it. Jeremy it's a real talent. If he ever does a sci-fi film let me know and I'll help promote it.